Gage Gubrud’s first reps as a Washington State quarterback may be delayed by a few months. Through a source, The Spokesman-Review confirmed a Cougfan.com report that the WSU QB and Eastern Washington graduate transfer suffered a lower-body injury during the team’s Midnight Maneuvers training regimen and could miss the entirety of spring camp. According to Cougfan.com, Gubrud injured either a foot or ankle when he caught his foot on a hurdle during one of WSU’s late-night workouts in Pullman. 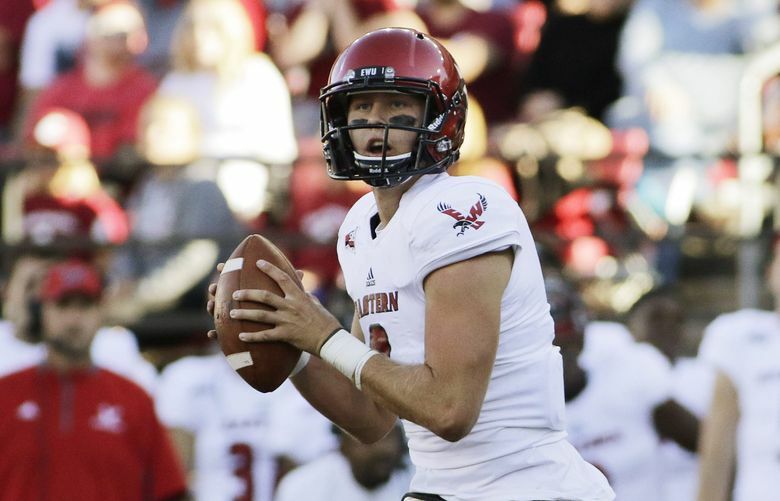 An S-R source clarified that it was either a left foot/ankle that Gubrud hurt and the QB did not reinjure the fractured toe that caused him to miss the final 10 games of EWU’s 2018 football season. The source also confirmed the injury would probably force the 6-foot-2, 205-pound Gubrud to miss spring camp, which begins on March 21 at Rogers Field/Martin Stadium in Pullman. The Cougars will hold 15 spring workouts between then and April 23, including the Crimson and Gray game, set for April 20 at Martin Stadium. Gubrud, who played 32 games and passed for nearly 10,000 yards in three seasons at EWU, enrolled in classes at WSU last month, making him eligible to compete for the Cougars in spring ball. That and Gubrud’s experience as a college football player should have given him an advantage when WSU’s pending QB competition begins later this month. The former FCS All-American and redshirt seniors Trey Tinsley and Anthony Gordon are expected to be the favorites to replace Pac-12 Offensive Player of the Year Gardner Minshew. If Gubrud can’t practice with the Cougars until August, he may draw some hope and optimism from Minshew’s situation. An East Carolina grad transfer, Minshew didn’t arrive on campus until spring workouts had finished and didn’t begin competing for the Cougars’ starting job until fall camp, although he arrived with preexisting knowledge of Mike Leach’s Air Raid offense. Minshew then won the job two weeks prior to WSU’s season opener at Wyoming.